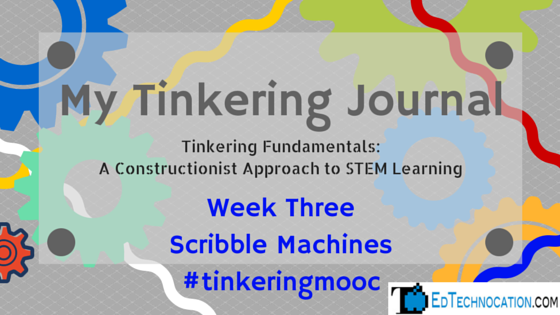 In week three of the Tinkering Fundamentals online course we made Scribble Bots! They are machines with drawing tools for legs and they can create fascinating works of art! We also explored how learning is possible through tinkering and play. Check out what I created! An activity like Scribble Bots can really allow students' creativity to shine. It also allows for variability in design and your students can end up with a wide range of bots! A simple and effective way to limit students to a designated workspace is to use hula-hoops. As a facilitator of the learning, we should draw attention to the small changes being made. Small changes can often lead to bigger impacts on the design. This type of activity requires dexterity which can lead some students to become easily frustrated, but we must try to let those frustrations play out. Frustration can sometimes lead to bigger breakthroughs! For week three we created Scribble Machines! This activity is all about creativity & iteration. I was given the basic necessities: markers, a motor, a battery, and a glue stick (for use as a counter weight). The rest of the materials were up to me and the goal was to design and build a Scribble Machine out of a variety of materials and in different ways. I started with an empty soda can (cause I like to drink soda). After attaching the motor and battery to the top of the can and testing it, I noticed that it rattled a lot. The motor would skip off the top of the can as it was running, causing all the noise. To dampen the noise I came up with the brilliant idea of placing a piece of paper towel underneath. Paper towel to reduce vibration. This greatly reduced the shaking of the motor and the noise (I was working on this late at night and didn’t want to wake my baby!). I gave the machine three marker legs and put it to the test. It worked b-e-a-utifully and created a circular design on the paper! The markers would hop and skip as the machine moved, creating dotted lines along the way. I wonder if the circular design was because of the shape of the container? Because we were encouraged to try different containers and designs, I also tried out this activity with an empty baby formula container (I’ve got plenty of these laying around!). After attaching the motor and battery to the top, I noticed the same issue with the rattling, so I stuck the paper towel underneath the motor again. Because of the rectangular shape of the container, I also decided to give it four marker legs this time instead of three. This scribble machine stayed on a rather straight path so I had to nudge it around a few times on the paper to create the design below. What I found intriguing about this machine is that every time I tested it, the markers would do something different. You’ll notice in the picture that the markers would sometimes create more solid lines, and other times would create dotted lines. Reflection: which learning dimensions and indicators from the framework are easy to see, and which are harder to pinpoint or recognize? For this weeks reflection, we had to refer to The Tinkering Studio's Learning Dimensions Framework. I believe the easiest indicator on the framework to spot is the student’s ability to offer explanation. Explanations of a strategy, or a tool, or an outcome can be achieved through conversation, group discussion,reflection, and journaling. I think the most difficult indicator to detect might be a student’s ability to display motivation or investment. This can be described as show a variety of emotions. But if you’ve worked with children, then you might understand how it can be difficult to read their emotions sometimes. Motivation might often be displayed through emotion, but not always. A student can be invested in their project, but they don’t necessarily have to display it through joy and excitement. A teacher must sometimes employ other methods for determining a student’s motivation, if this is the case. We also had to find two other answers on the forum and respond to them as well. I feel for our fixed mindset students that persisting towards their goal in the face of setbacks can be a problem. Disagreeing with strategies of others in a constructive way can be difficult for my high school students. Connecting to prior knowledge is somewhat difficult for my high school students. The positive aspects of this program totally outweigh the above paragraph. My high school students love hands on projects and I feel even if they couldn't figure something out with this project they would try a different method. When it comes to roadblocks in academic subjects they are not willing to take as many risks. My response: I'll be teaching a class of middle and high school students for the first time this school year (we start in about 2 weeks), and lucky enough, the course is called "Make It 101"! I'm excited, but also nervous, to be working with older students. And I fear the exact problems you mention: fixed mindset, constructive disagreement, connecting prior knowledge. But I hope my students have chosen this elective course because they have an interest in making and tinkering and come with an open mind and ideas of their own, willing to share. I think that engagement is probably the learning dimension that is easiest to see. For me, it is obvious when a student is deeply engaged in what they're working on. Development of understanding is probably the hardest one for me to recognize. Sometimes I'll see students working in our makerspace and it will look like they're fooling around and not really trying to be creative. But then I'll come back later and they'll be working on an amazing project - they just needed that goofing off time to figure out their ideas. My Response: As teachers, we often confuse the "organized chaos" and the playful attitudes as distractions and being off task. But, we need to realize that this is exactly what our students need. Some students thrive on the chaotic (but organized) nature of the environment: the noise, the bustling, and all the activity. Maybe this is why our students like to visit the coffee shop to study sometimes. They also need the opportunity to be playful and to play. They need time to connect with their classmates, to have a friendly conversation about the weekend. This "goofing off" allows them to build stronger connections and relationships with their peers so they can get to the real work! 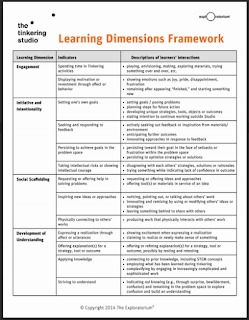 Share with me: What's your take on the Learning Dimensions Framework? Do you see this as a valuable tool in your MakerEd classroom?